Andrew McKenna is one of Chicago’s premier businessmen. He is nicknamed “St. Andrew of the Boardroom” because most of his work happens behind the scenes and he is a highly sought-after figure in the field of corporate governance. 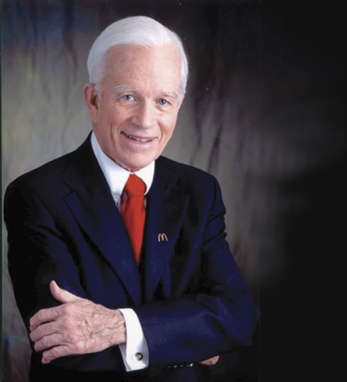 Currently, Andrew serves as chairman of McDonald’s Corporation and Schwarz Supply Source (a position he has held since 1964). He is also a director of Ryan Specialty Group, McDonald’s Corporation, the Chicago Bears Football Club and Skyline Corporation. In addition to his private sector positions, he is a director of the Ann & Robert H. Lurie Children’s Hospital of Chicago, the Big Shoulders Fund, the Ireland Economic Advisory Board, Lyric Opera of Chicago, the Museum of Science and Industry, Civic Committee and the United Way of Metropolitan Chicago. And he has called for other corporate leaders to involve themselves with the community around them. “All of us need to recognize there are community needs we must respond to, and while it may be personally fulfilling to help, it’s also critically important to do so,” he says. A graduate of the University of Notre Dame with a B.S. in business administration, McKenna was awarded the university’s Laetare Medal in 2000. He served as the chairman of the board of trustees from 1992-2000 and continues on the board today. McKenna is a graduate of the DePaul University Law School where he received a Doctor of Jurisprudence.